While panning for gold in Wyoming, a few prospectors have instead found raw diamonds in their pans. Along with the United States, diamonds can be found in at least 13 countries either loose in rivers and on beaches or encased in rock or other material. Looking in the right places and knowing what to look for may yield a raw diamond. Diamonds have specific characteristics that set them apart from other gemstones, and tests can confirm whether what you’ve found is actually a diamond. Become familiar with diamonds in their natural state. Diamonds come in many shapes, including a cube, flat and irregular, and may have many faces or sides. They can also have many different surface types, such as frosted. Along with being colorless, diamonds can be found in a variety of colors, including brown, green, pink, red, blue, black and orange. Hunt for loose diamonds in streams, sea floors and on beaches. In the United States, Wyoming and Colorado should yield diamonds. A few other countries with known diamond deposits are Canada, South Africa and Ghana. Use gold panning methods to isolate rough diamonds. Put rock or sand in a shallow pan or box screen and swish water around in it so that lighter materials wash out, leaving the heavier gems and stones. Use tweezers to pick up your find and place it in a covered container for safekeeping. Visit the Crater of Diamonds State Park in Arkansas for a less adventurous way to look for diamonds. According to the Arkansas state website, it is the only public diamond mine in the world. You can keep whatever diamonds you find in a 37-acre plowed field. Test to see if your gem repels water. If it does, that’s an indication you may have a diamond. Use a thermal conductivity tester on a clean, flat surface of your find to test for how quickly heat is conducted. 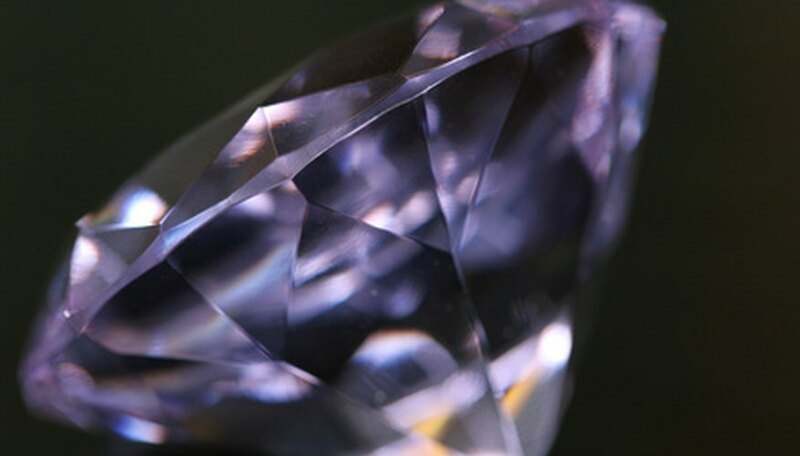 Diamonds disperse heat much more readily than most other gemstones. Kelly Ross of the Canadian Institute of Gemmology has had excellent results with this method. Look at raw diamonds under a microscope or with a 10x power jeweler’s loupe. Crystal areas may be rounded and may have tiny indented triangles, says W. Dan Hausel of LearnGoldProspecting.com. Cubic diamonds may have similar markings along with parallelograms or rotated squares. Diamonds will have the appearance of being coated with a thin film of Vaseline. Perform a scratch test. The best way to do this is to rub the suspected diamond on a corundum -- synthetic ruby or sapphire -- plate. Diamonds are rated at a hardness of 10, and rubies and sapphires at a hardness of 9. If you have found a diamond, it will scratch the corundum plate. You could also use an etching pencil with a very small piece of corundum on the end and rub it against the piece you found to see if it will scratch. Test for gravity. Place the gem you found in a solution with a specific gravity of 3.52. If it’s a diamond, it will float. Colorless topaz would also float but it has a lower hardness rating, which would rule it out as a diamond. Fremont, Liz. "How to Test and Find Raw Diamonds." Sciencing, https://sciencing.com/test-raw-diamonds-7640072.html. 25 April 2017.